PlayBox Neo MAM organises your digital library. Content can be searched, browsed and distributed easily anywhere within your broadcast workflow. PlayBox Neo MAM sits at the heart of the broadcast structure providing organized access to the most important asset any broadcaster has, it's content. PlayBox MAM makes your content viewable and deliverable to any area of your organisation, speeding up workflows and delivering considerable time and cost savings over traditional broadcast structures. PlayBox Neo broadcast automation systems support all existing I/O interfaces, all video and audio standards, graphics and compression formats. PlayBox Neo systems can be personalized to fulfill a wide range of extraordinary workflow requirements. The automation system has a scalable and modular architecture that enables broadcasters to configure their systems with dynamic interfaces, as well as intelligent and customizable 'rules' that meet precise workflow requirements and eliminate repetitive and labour-intensive functions. PlayBox Neo developed TitleBox Neo, an interactive character generator and graphics system that can create, display and control fascinating multi-zone screens with rolls, crawls, animations, clocks, station logos and more. Its unprecedented level of interactive control over the on-air CG objects turns TitleBox into a powerful tool, ideally suited for channel branding, music channels, live entertainment programmes, presentations, sports events titling and etc. The digital age continues to make it increasingly easy for us to create, access and obtain media content in a multitude of formats. The speed and the amount of content we now have at our fingertips is incredible. 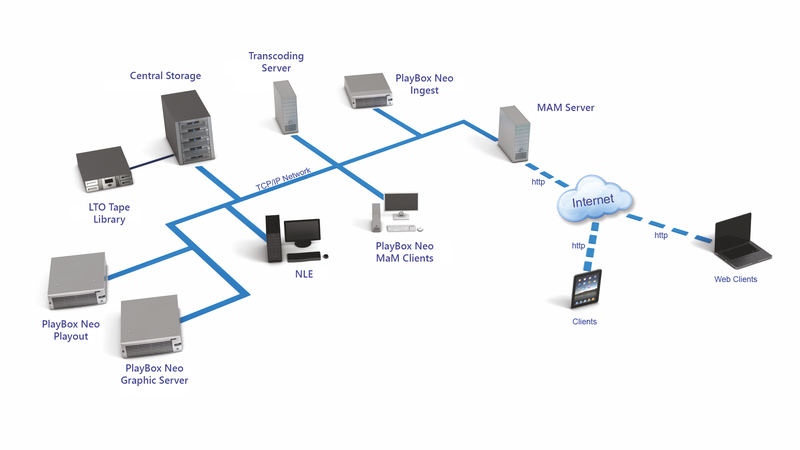 PlayBox Neo MAM organizes and manages the assets of single or multi-channel operations, as well as the other content of diverse business operations. It is designed so that it can handle hundreds of users and millions of assets. Multi-user, multi-location web client access and Internet sharing makes it perfect for long distance partnership between different offices of one organization.